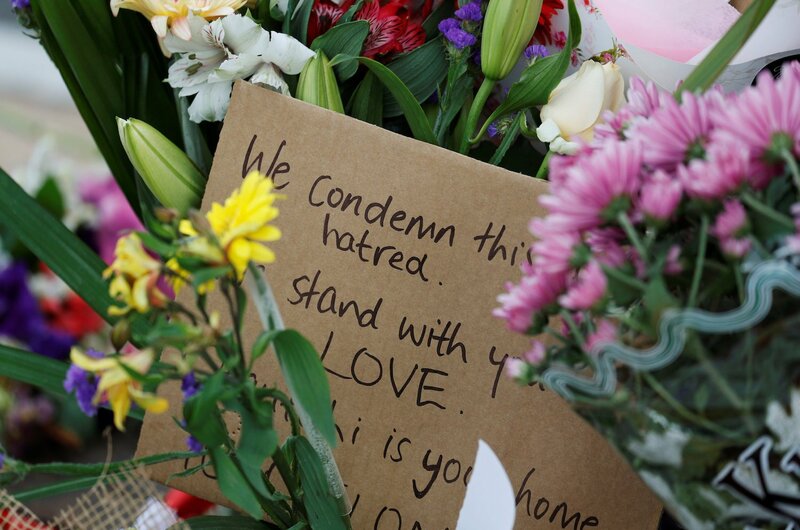 The predictable response to the Christchurch mosque attacks was a call for tighter gun control. It defies logic that each country should need to experience its own slaughter of innocent people before starting a serious conversation about restricting access to guns, semi-automatic weapons in particular. How is it possible for one person to legally accumulate five weapons – including ones designed for use by security forces to protect the public? Does each government need a massacre on its home turf before it will legislate against this profligacy of lethal weapons, which are handed legally to sociopaths filled with hatred? In the US, Norway, Canada and elsewhere, innocent people have paid with their lives for the mythical power of the notion that human beings have a right to keep and bear arms, a notion supported by strong lobbies of weapon manufacturers and those who confuse the right to self defense with some divine right to carry guns. However, what is revealed by the murder of 50 Muslims during their moment of devotion goes far beyond the issue of gun control. It goes straight to the heart of the subculture of hate that has become a chilling and widespread aspect of human society, accompanied by lethal actions broadcast live on social media. Scarily, when such groups commit themselves to “securing the existence of our people and a future for white children,” these are not just words but, literally, a call to arms. To refuse to utter the name of the killer is not only a mark of respect to the victims and survivors but also recognition that, beyond their distorted ideology, these mass-murders are also pathological attention seekers looking to become “celebrities” so that they might become an inspiration for copycat terrorist attacks. This sickening ideology is not confined to the US, although its worrying predominance there makes it a major inspiration for others. Even more disturbing is that its lies and incitements are creeping into more legitimate social discourse and being presented by mainstream politicians, albeit in a more “sugar-coated” style. The populist-nationalist language used widely by some politicians and segments of the media is helping to make views that used to belong to pariahs increasingly acceptable as they are gradually pushed to center stage. If lack of gun control is one pillar of support for atrocities such as Christchurch, and another is the legitimacy lent by some authority figures to the demonization and dehumanization of minorities and foreigners, a third is provided by social media, with its ability to rapidly spread such toxic ideological waste far and wide. Only by dealing with all three of these pillars, through legislation, education and socialization targeting hate speech, and by enshrining inclusivity as a global priority, can we hope to at least contain, and perhaps eventually prevent, hate crimes. The contemptible killing of Muslims in Christchurch stems from a dark sociopathy similar to that of the supremacist gunman who entered a church in Charleston, South Carolina, and murdered nine African Americans during a bible study service in June 2017, or of the immigrant-hating anti-semite who killed 11 people attending a service in a Pittsburgh synagogue in October last year. New Zealand’s prime minister, Jacinda Ardern, in her dignified and steely response to the massacre, set an example for the rest of the world in how to deal with such atrocities. The way she reached out to the families, friends and communities of those who were murdered, while also setting a precedent by promising never to mention the name of the killer and taking immediate action to legislate for tighter gun control, was a demonstration of powerful and sensitive leadership. To refuse to utter the name of the killer is not only a mark of respect to the victims and survivors but also recognition that, beyond their distorted ideology, these mass-murders are also pathological attention seekers looking to become “celebrities” so that they might become an inspiration for copycat terrorist attacks. To embark on the massacre of dozens of people while broadcasting it live on social media is sickening. of course, but it also demonstrates the psychopath’s craving for publicity, a craving that new technologies are able to satisfy ever more easily. There is no single measure or magic formula that can entirely eradicate the phenomenon of hate crime in all its manifestations but there are courses of action that can significantly reduce it. Limiting access to weapons, especially semi-automatic rifles, would be an obvious and essential start. Ensuring that those who spread hate in society face the full force of the law should also be a top priority, along with improving the regulation of social media so that such people do not have platforms on which to disseminate their poisonous views and feel empowered by their followers. But above all, there is a need for dialogue about inclusivity, and for building a strong coalition of people of all religious and ethnic backgrounds, representing the vast majority of us who want to coexist harmoniously.